Hello! You may have noticed recently that I’ve been reaching for lighter bases quite regularly, which is something I’ve never done before. Perfect skin is never something I’ve possessed as I’ve always had issues with blemishes, pores, uneven skin so opted for a more medium-full coverage foundation to cover and sort all of these issues out. Since starting to read more beauty blogs and get my skincare on track, my skin has improved somewhat and I’ve been able to try light-medium coverage bases for the first time. I’ll split it into matte and radiant finishes, as they’re the two different finishes I go for depending on what I want that day. Matte or Natural | Being a combination skinned girl, I’ve always opted for more matte finishes to help minimise the look of oil throughout the day. The first of these more matte or natural finish foundations is the lovely Estee Lauder Double Wear Light (shade Intensity 1-0), which I have completely fallen in love with. You can build this up to medium coverage if desired, but it does really even out your skin and make pores look smaller, all the while giving your skin the most lovely finish which stays for hours and hours. The double wear range is really amazing and have yet to find a product from it that I didn’t like! Next is a recent release from Benefit and it’s the Benefit Big Easy (shade Light), which claims to be ‘better than BB’. It’s a lightweight creamy liquid-to-powder formula, which applies well to skin (though clings to dry patches – moisturise well!) and gives skin the most natural, almost semi-matte finish. I find I can’t apply too much of this and it blends well with either a brush or fingertips. Radiant or Dewy | The finish I’ve been reaching for a lot recently is a more radiant finish, as I can always apply a touch of powder if needed, as it gives my dull skin a bit of a boost. YSL Touche Eclat Foundation (shade BR10) is a light-medium coverage foundation with such a gorgeous glowy finish. I always had to mix this half and half with my EL Double Wear (original formula) to get the coverage I wanted, but recently it’s been fine on it’s own. I find I do have to powder my nose so it doesn’t settle into pores too much, but other than that it’s a lovely foundation that gives an even finish. Lastly, and something I thought I’d never buy, is a tinted moisturiser. The NARS Pure Radiant Tinted Moisturiser (shade Terre-Neuve) is such an easy to apply, lazy day base which I’ve been really enjoying using recently. It gives a very light amount of coverage, remembering you can sort out any imperfections with a touch of concealer, and does really work to even out skin and adds such a huge amount of luminosity to your complexion! 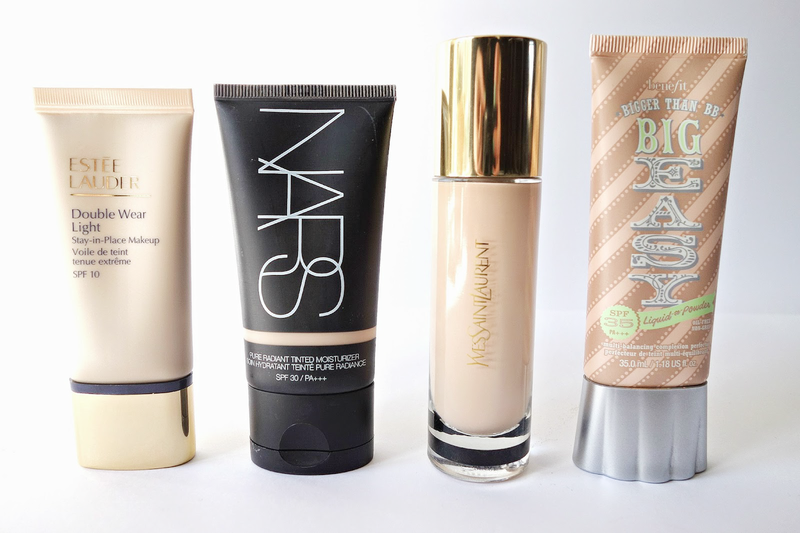 All of these have SPF, apart from the YSL one (that I can tell from research anyways) so make perfect bases for Summer if the weather decides to get warmer. Which one will you be reaching for?